So what’s a girl to do when she finds a little piece of half price clearance steak at ALDI? 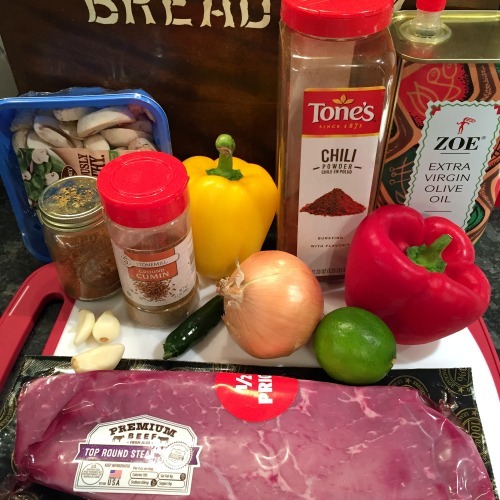 What else but make Steak Fajitas with Onions, Peppers, and Mushrooms, of course! 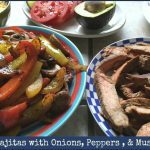 Thin, lean cuts of beef like this one lend themselves an easy steak fajitas recipe, where you just quick sear the steak whole in its flavorful marinade and then slice it even more thinly. 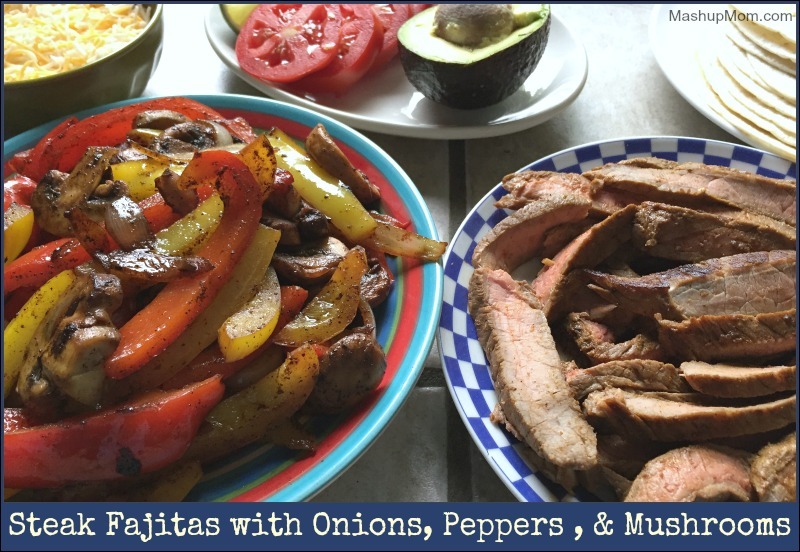 While I do love making fajitas of all kinds for a quick & crowd-pleasing weeknight dinner, I’ll confess: I usually just wing it rather than using a specific recipe. 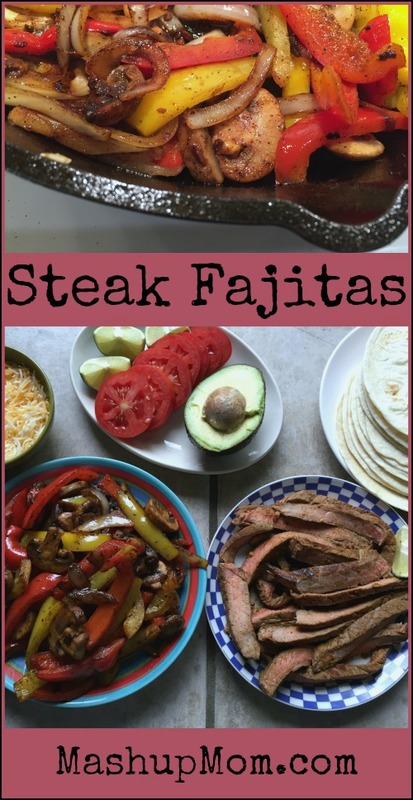 This specific steak fajitas recipe encapsulates what I did this time (and they were goood… better than last time, so it’s a good thing I wrote it down), but it’s quite a forgiving process. Don’t like mushrooms? Leave them out and maybe add another bell pepper. Don’t like steak? Try chicken, maybe using this chicken fajitas recipe for ideas (see? 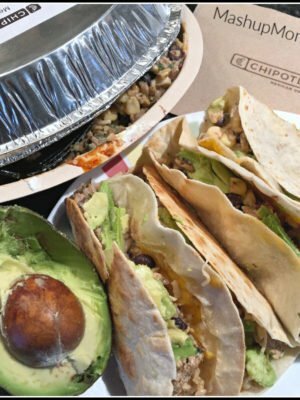 did it differently there, and they were still good, lol)… or you can try these chipotle lime shrimp in fajitas, rather than in their original taco salad. But let’s get back to steak! I don’t post a lot of steak recipes here, but it’s much easier on your budget to use just a pound of beef and stretch it out with all of these assorted veggies & accoutrements, rather than going with a basic steak-and-potatoes recipe that requires more meat per person. After marinating: Heat 1 Tbsp of olive oil in your 12″ cast iron skillet on medium-high heat until shimmering, swirl to coat the bottom of the pan, then add the steak and cook for three minutes per side (or until cooked through medium rare). Remove steak from pan and let it rest while you cook the veggies. Add another Tbsp olive oil to the same skillet and scrape up the browned bits on the bottom. Add onion to the pan and cook for one minute over medium-high heat. Add one clove chopped garlic and the mushrooms and cook for another two minutes, stirring occasionally. Add another Tbsp of olive oil and the bell peppers, then continue sauteing for another three minutes, stirring occasionally, until peppers are crisp-tender. Turn off the heat under your pan. Yum, look at that char! 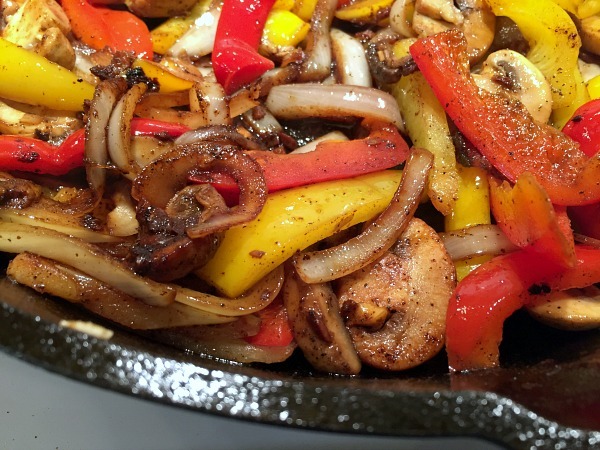 This is another reason to love your cast iron skillet: It makes for such a pretty sear in foods like fajitas! You don’t even need to add any extra seasonings to the veggies when you make them this way, because they pick up what’s left in the pan from the steak and let all the flavors work together as a whole. So good! My carnivorous family devoured all of the steak and most of the veggies, but the leftover peppers/onions/mushrooms worked very well in veggie quesadillas for lunch the next day. 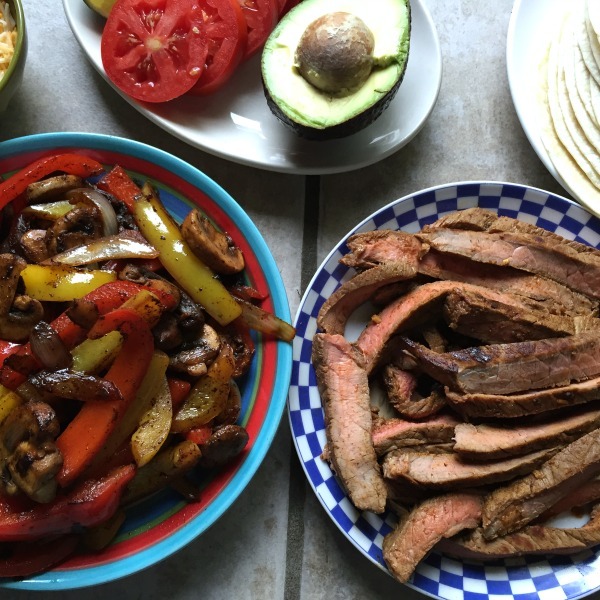 The meat and veggies here are naturally low carb and gluten free, so MashupDad enjoyed his steak fajitas on a low carb wrap (and you can easily serve them on corn or other gluten free tortillas, if you’re gluten free). It's much easier on your budget to stretch out one pound of steak with all of these assorted veggies & accoutrements, rather than going with a basic steak-and-potatoes recipe that requires more meat per person. After marinating: Heat 1 Tbsp of olive oil in your 12" cast iron skillet on medium-high heat until shimmering, swirl to coat the bottom of the pan, then add the steak and cook for three minutes per side (or until cooked through medium rare). Remove steak from pan and let it rest while you cook the veggies. I have made these lately with the inner skirt steak that has been on sale at Butera. Have them trim and tenderize the meat. We never have enough meat when i make them! I tend to use my own seasonings, but i found a packet of fajita seasoning I bought from Aldi (who knows when). I grilled the marinated steak on the grill and then in a skillet i added a teaspoon or 2 of oil and the veggies. Cranked up the heat and sprinkled on the fajita seaoning and then at the last minute added the steak. Wow! Better than any fajita meal I have had in a restaurant! Topped with some Herdez Guacamole sauce- extreemely spicy! Yum! I didn’t even know ALDI had a fajita seasoning mix, cool. I’m making these tonight! 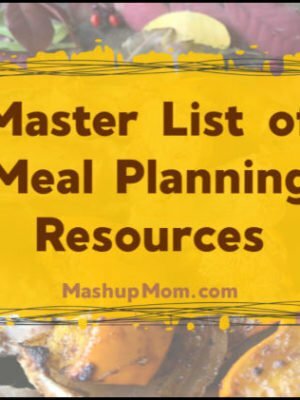 I bought my $60 meal plan grocery list on Sunday morning and so far the Cilantro Lime Turkey Burgers & the Roasted Vegetable Tortellini was AWESOME!!! Thank you for everything you do!!! 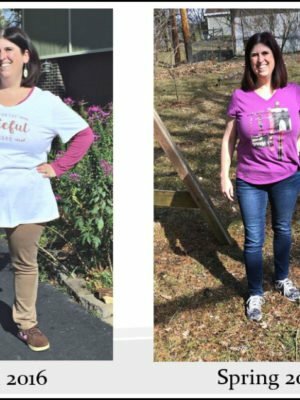 I just found your website this past weekend and I am so happy! I hope this helps my budget, I was spending over $300 a week on groceries! Oh my goodness, this was so good! 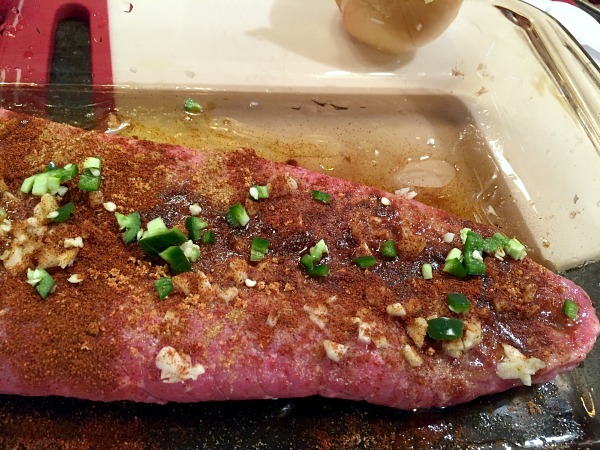 Everyone gobbled it up…and I’m lol’ing because I just now read the last line of the post that said to open the window or run a fan…think the garlic or chili seasoning got caught in all of our throats as I seared the steak and we were all coughing! But the meal was fantastic! Thanks for a great recipe! Our family of 4 LOVED these! Excellent spice rub recipe. We were able to turn the leftovers into quesadillas on night 2! BEAUTIFUL! I didn’t have any jalapenos or mushrooms, but I’m not even sure how they could have made this any better! I did add plain sea salt to the steak, but only because we like salty. 😉 Hubby cooked the steak on the griddle and I whipped up a side of guacamole. 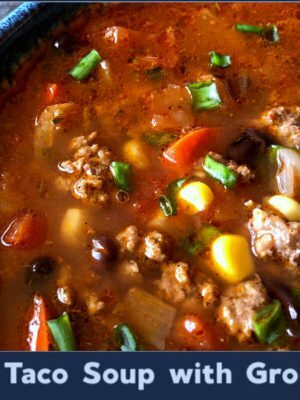 This is a new staple in my recipe rotation. ^_^ THANK YOU!